With old room-mates and friends from the college walking group, (some of us had not met for 15 years), we decided to have a reunion walking holiday in September. The MYTIME OUTDOOR CENTRE had plenty of beds and an ideal location close to the coast path on the Isle of Purbeck and reasonable journey from where we had all settled. Life had moved on and many of us had families, so the local attractions of Corfe Castle, Swanage Steam Railway and seaside resort of Swanage were all promising. We arrived, car by car, after dark, each car making its cautious journey along a track which left the road and disappeared across a field. Everyone agreed it was a relief to find the centre all lit up and full of excited children a few minutes later. We had organised a rota for meals, each family serving up their speciality to the crowd. Cathy’s chocolate pudding got the most compliments (see photo). As the kids played, we adults found that we had not changed a bit since the days we used to go on walking trips together, and each of us slotted into our old role as we talked late into the night. We looked at the brilliant OS Explorer map of the Isle of Purbeck area and traced good routes along the coast, up ravines (chines) and though villages, ensuring there would be a PH for lunch. When the day dawned the weather was fantastic. As it was the last chance of the year we thought we would take the kids to the beach first and walk in the afternoon, and so headed off on a 10 minute car journey to Studland Beach on the Isle of Purbeck, just over the headland from Swanage Bay A pretty walk from the National Trust Car park took us to a long sandy bay sheltered from the wind. There was an enterprising cafe on the shore where you could get tea, coffee and food all fair-trade and organic. The cafe had benches that over looked the beach and free beach toys you could borrow if you forgot yours. The biggest surprise of the day was when an ice cream boat turned up, complete with jingle, and we sent the children wading out waist deep with £10 notes held just above the waves. The kids swam, we kept talking and the day moved on. We left the beach as evening approached, assuring ourselves that we would go walking tomorrow. I called in at Swanage for some supplies and returned to find dinner nearly cooked (including the smell of chocolate pudding). The next day we did manage to start a walk, straight from the centre out along the coast path, but as soon as we reached the sea at Deadmans Bay we got held up by the hundreds of fossils set in the mud stone. 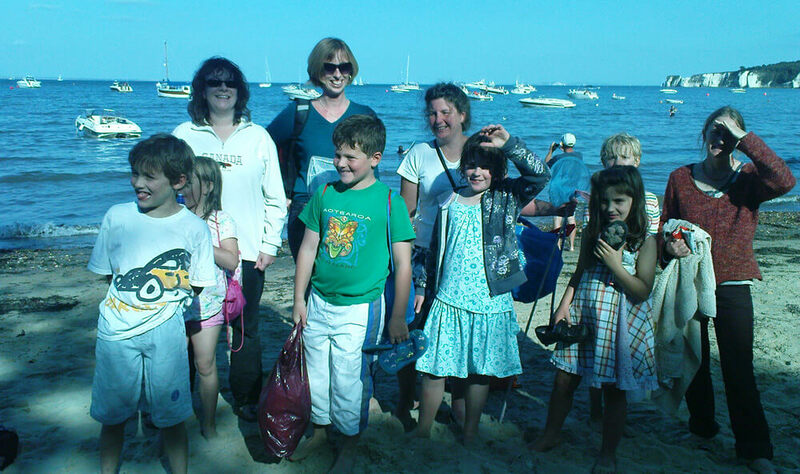 The weather was so hot that the children swam (despite the warning that a Portuguese Man o’War jellyfish had been seen in the bay a few weeks earlier) and everyone waded out into the water to see the fossils set in the seabed. A good few hours later we left Deadmans cove, clutching muddy stones, and returned to the centre to tidy up and make our journeys home, promising we would come back to the Isle of Purbeck next year and do some of those lovely walks.